As the latter part of this year has drawn to a conclusion, a significant portion of it has been dominated in recent days and months by the horrific tragedy and senseless phenomenon of scores of lesbian, gay, bisexual, and transgender individuals choosing to take their own lives as a result of ever increasing pressure being forced upon them by intense harassment and bullying because of their actual or perceived sexual orientation. Subsequently – and admirably – much attention has been brought to this unfortunate trend still present within American society. The fact that such discrimination does unfortunately still exist has been exposed, concrete solutions have been offered in its wake, and a global exhortation to exercise tolerance and rational judgement on behalf of all those who may be different or perceived as contrary to the “norm” has been held up as a model for all people of goodwill to exemplify and implement. The state legislature of New Jersey has even passed its own robust version of anti-bullying legislation to be enforced within its education system which would protect all those who suffer as a result of these intense forms of ridicule and harassment (the bill also includes a specific provision to recognize one’s sexual orientation as one of the characteristics that a person could be harassed or discriminated against for) – in this case only time will tell whether it will ultimately be approved and signed into law by the governor, Chris Christie, who as a recently elected hero of the Tea Party movement is understandably skeptical about signing on to the bill’s clause concerning sexual orientation. Yet, even with all of these very public admissions of culpability and inadequacy on responding to this crisis within our culture, are we really attacking the core cause of the issue? Ultimately, teaching children of each passing generation to do on to others as they would have others do to them is left to the discretion of individual families and the manner in which they instill values which they hold as important to their children. Consequently, combatting this type of discrimination is, for the most part, a grassroots undertaking. Of course, legal and institutional endorsements do help greatly to change the climate and atmosphere of discussion, and help to collectively move society forward – from ignorance to rationality. However it is still left up to individuals to create a culture of reason, understanding, and enlightenment. I have had my own firsthand experiences with bullying and ridicule. Although I can’t say that I’ve ever felt the desire to contemplate suicide, there have been moments that were so unbearable that I would wonder what my point and purpose in life was if so many people simply didn’t understand me. Even before I was at the point where I was ready to come out, I remember being teased, often with homophobic remarks. Again, it never got to the point where the onslaught was so intense that I thought my life was no longer worth living. But I could never help but wonder, why are some individuals so cruel? Why must others single out the differences of people’s makeups and personalities and hold them up as objects of scorn and humiliation? I’m delighted to say that when I finally reached high school and as I would eventually complete it – although there were a few notable exceptions – teasing and bullying en masse ended. I was fortunate to be able to develop a wonderful group of friends who were extremely supportive and affirming of all the facets of my personality, many of them I’m still close with even today. It was in this atmosphere of tolerance and solidarity that I finally felt incubated enough in love to have the courage to come out of the closet of denial and fully accept who I was as God had created me. Thus, for me, circumstances did truly take a positive turn. The older I became, the more I realized that people my age really didn’t care about who I was attracted to. Really – at least when exercised by the typical alpha-male jock-type guys who are usually perpetrators of the behavior toward their gay peers in high school – I saw that sometimes homophobia can be a mask for not only ignorance but also veiled insecurities, and in the most extreme cases, a desperate attempt to deny one’s own attractions which they secretly may share with those they persecute. Now, from this vantage point, I can say that things truly have gotten better. It’s very easy to say this now, once our own situations have improved. But what can we tell those still in the trenches of elementary school, middle school, high school and sometimes even in college who continue to endure bullying as a part of life? Especially for those individuals who happen to be Catholics – who are addressed by most of the hierarchical leaders of their church by describing their attractions as “disordered” and advising them that celibacy is the only valid option conducive to holiness available in their lives – how can they kindle hope within their hearts, and who can they turn to for inspiration during – what must seem to them – to be the darkest of times? We as Christians often forget that the Christ we follow may very well be the world’s best known victim of bullying. From the beginning of His public ministry, Jesus was met with ignorance and outright hostility. Almost immediately after the nativity narratives of Christ’s birth and early childhood conclude in the Gospel of Luke a picture is painted of the climate into which Jesus would enter as He began to carry out the work that the Spirit of God seemingly impelled Him to do, beyond and above whatever the costs might be. Even though the historical credibility of the statements made by Jesus in the story may be rather dubious (according to the most objective and accurate sources of biblical scholarship, Jesus quoting Isaiah was most likely a later interpretation about Him made by His followers as they interpreted His life, death, and resurrection decades after they occurred – Jesus most likely never thought of or referred to Himself as “the Messiah”) it proves the point that from the very beginning, many were opposed to the message that Jesus stood for and espoused – namely, a direct and unencumbered way to bring about and access the “Reign of God”, the promise of justice, tolerance, and compassion that it gave to all who took heart and paid heed to the Nazarene’s words. To Jesus, God was not a far off egotist Who needed to be placated by the offerings of animals or the adherence to regimented rubrics composed by men – God was rather an incontainable Reality that was tangible and near to all, so much so that Jesus referred to the Divine as “Abba” (“Daddy” in the Aramaic of His day which He would have spoken). This was clearly, diametrically opposed to the system and mindset which the Jewish religious leaders of the day propagated and served as heralds of. To them, the Temple of Jerusalem – and the dogmatic tenants which served as its foundation – was the only true and valid way to access God in a meaningful sense. This of course meant that the Pharisees, Sadducees, Levites and all Jewish religious leaders considered themselves the gateways through which all sincerely heartfelt Jews would have to pass through in order to legitimize and substantiate their relationship with God. Thus, the message from institutional Judaism of the day was: God is not a monopoly for all, but rather, a commodity that can only be accessed through His vehicles here on earth. Sound familiar? With great reason, the institutional leaders of Judaism felt threatened and negatively subjected by the message being proclaimed by this Jesus of Nazareth. Throughout Jesus’ public ministry the Pharisees actively, “went out and took counsel against Him, seeking how to destroy Him” (Matthew 12:14) Jesus of course would come head to head with these hypocritical clerics countless times, reminding them to not focus upon the letter of the Mosaic law, but rather on the universal commandments of morality and justice which God has exhorted all to follow. We know how the rest of the narrative follows. 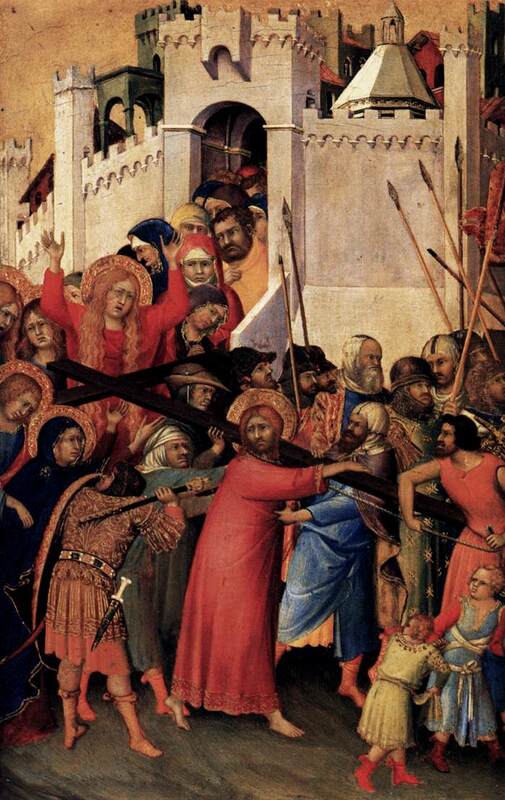 Ultimately, Jesus’ passion for the Reign of God would bring about His own Passion and Death. He would die the cruelest and most humiliating fate imaginable at the time, crucifixion. Yet through it all, Jesus never lost sight of the saving God who remains ever-present in our midst. Crushed by the forces of intolerance, oppression, and hypocrisy Jesus would follow God even unto death. Yet this was not the final extinguishing of Jesus of Nazareth. Following His death, His disciples and followers experienced Him as alive – now united to the Divine, possessing all traits and characteristics which flow with it. The Jesus they knew had been transformed into a new, unspeakable Reality – a Presence, Who was one with God and remained permeable to His followers in an ever dynamic empowering way. Christ, the Risen Lord continues to guide the People of God – even amidst the turmoils and internal conflicts which seem to disrupt it – ever forward into the pages of history. Catholics and all Christians who are persecuted for any reason – their sexual orientation, or their very faith in Christ in places where being a Christian is a thing of ridicule – can be confident that no matter how difficult it can be to continue to face daily those who choose to revile and make our very existences so unpleasant to endure, Jesus has seen it all and done it before. Many of His immediate followers were not spared the same fate of their Master, even as their message and numbers grew following the Resurrection. Throughout the centuries, members of the Body of Christ have had to suffer various trials and persecutions. But we have survived, and continue to endure to this day – sustained by Christ’s ever-abiding presence among us, particularly and uniquely in the Eucharist. Know that as Jesus achieved union with God by passing even through the veil of death, God did not abandon him, and nor would He ever consider doing so with us! Even as He entered the realm of death, God was with him. Where there seems to be only decay, destruction, and immobility – know that new life and new possibilities are around the corner. This is our faith, that never a day goes by where we are denied the possibility – even through turmoil and struggle – to become new creations, and enter into ever new realities as we have been shaped, and molded by the struggles that refine us. Also, know that we are never alone. That as long as members of the Body of Christ remain as a testament to the world, so does Jesus Christ Himself. Have courage and don’t give up! It does get better! What a beautiful, inspiring, and moving reflection! I was also a survivor of bullying, and although I turned to God during that time, I never made the connection myself that my God had also endured bullying. What a powerful thing to remember!